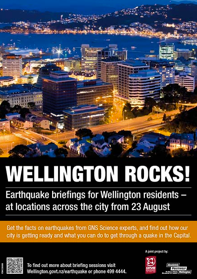 Council and GNS Science are hosting a series of briefings to answer your questions on earthquakes, the strengthening of buildings, preparations we're making to increase Wellington's resilience and what you can do to make sure your family are ready to cope with an earthquake. Or you can phone 499 4444. Here in Hataitai, the meeting will be held on Tuesday 23rd October at 7:30 pm, at the Sea Cadet Centre, 393 Evans Bay Parade.